This angular building was once the headquarters of an elite army corps, and is now a cultural centre, housing exhibitions and concerts. 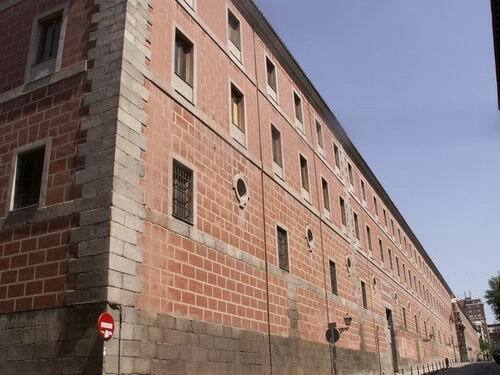 It was built in the early 18th century for King Phillip V who ordered the construction in the Calle de la Puerta de Conde-Duque of a large barracks which would house his elite personal guard of 600 soldiers and 400 horses. The Compañías Reales de Guardias de Corps had been created in 1704 as the Royal Guard, and were considered the best and most flamboyant soldiers in the country. In 1717 the architect Pedro de Ribera was given the task of designing a new barracks building for them. In an attempt to marry beauty and functionality, Ribera designed a baroque building in the churriguerresque style. Churriguerresque was a uniquely Spanish baroque form of ornamental sculptural decoration used between the late 17th and mid 18th centuries, and reminiscent of the earlier Moorish architecture. The style takes its name from the author José Benito de Churriguera, and Churriguerresque features are generally seen above the main entrance to a building. In the case of the Cuartel, Ribera chose to use this style in decorating the entrance to the barracks on the east side, which drew the criticism of his more classically minded colleagues. He designed three large courtyards inside the barracks, and a large tower on the east side of the building was originally used to house political prisoners, but was heavily damaged during a fire in 1869, which also destroyed the upper floors. After this, the building began to fall into disrepair. Not until 1969 were plans laid to restore the barracks, when the architect Julio Cano Lasso was given the job of redesigning the complex which today houses the Municipal Museum of Contemporary Art. The exhibitions of painting, sculpture, photography and graphics take you on an interpretive tour of Spanish art and are well worth a visit, especially as entrance is free. The complex also houses Madrid's historical archives, newspaper and video libraries and two concert halls. In summer, live concerts are held outdoors in the courtyard. In winter, the buildings are open Tuesday to Friday, from 10am to 2pm and from 5.30pm to 9pm (10.30am to 2.30pm on Sundays and holidays). In summer the buildings are open daily (except Monday) from 10am to 2pm and from 6pm to 9pm (10.30am to 2pm on Sundays and holidays). The barracks are fairly centrally located, and only a short walk from the Gran Via and Plaza de España. The nearest metro stations are Noviciado, Ventura Rodríguez and Plaza de España.